Short Delay Times: < 78nsec Typ. 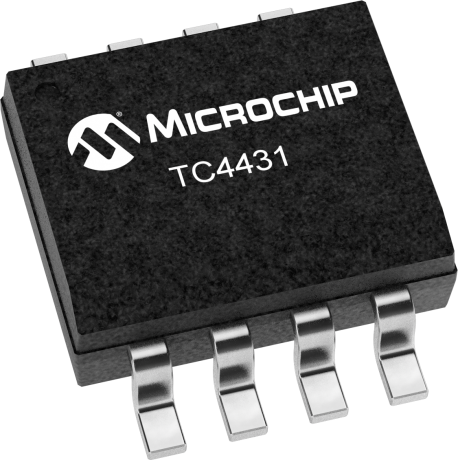 The TC4431/4432 are 30V CMOS buffer/drivers suitable for use in high-side driver applications. They will not latch up under any conditions within their power and voltage ratings. They can accept, without damage or logic upset, up to 300mA of reverse current (of either polarity) being forced back into their outputs. All terminals are fully protected against up to 4 kV of electrostatic discharge. Under-voltage lockout circuitry forces the output to a "low" state when the input supply voltage drops below 7V. For operation in lower voltages, disable the lockout and start-up circuit by grounding pin 3(LOCK DIS); for all other situations, pin 3 (LOCK DIS) should be left floating. The under-voltage lockout and start-up circuit gives brown out protection when driving MOSFETS.